How I deal with email. Next Google: excellence and diversity? TBH I’ve stopped reading RSS at all and manually visit just 2 or 3 blogs, and then infrequently. I tend to read individual posts when highlighted in twitter instead. As for email, I tend to reply/act (or not) straight away and tell everyone I meet to feel free to pester me as I *will* forget things and I *won’t* take offence at a polite (or even firm) nudge. I think that with the volume of email I have to deal with (c. 30-40/day) I can usually manage fine. It’s the unsolicited stuff (from Twitterers, forumites and the like) that I forget about. If the Head of Science has asked me to do something – or the Head – then I can remember pretty reliably. here’s my homework teach! that’s a pretty straightforward system, doug. i like an empty inbox myself, so i do something similar. 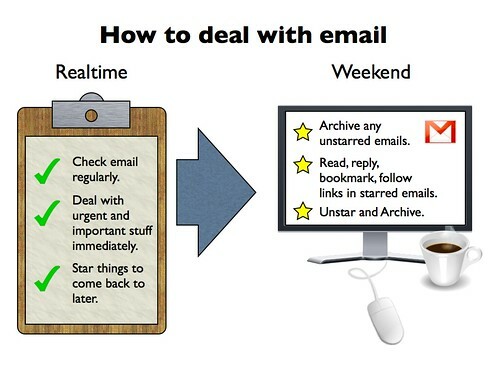 check email often, respond to important ones, archive everything, and delete any junk (though i try to take care of this by not receiving in the first place). the rss feed, though, i think i’d freak out if it showed up in my email! i check it 3 times daily, open any links immediately that are of interest, then bookmark in diigo as needed. there IS nothing worse than seeing several hundred (or, heaven forbid, thousands) of items in the feed! I used to check email two maybe three times an hour and if a notification came up in the corner I stopped what I was doing. Now I only open the mailbox 3 times a day and never just before I am going home. Have I missed a few opportunities? Maybe, but have I also met more deadlines and remained focused to then task in hand? Certainly! I also use email notification rather than RSS. Yes, it’s all about ‘flow’, isn’t it Ian? Sometimes things interrupt your flow, sometimes they don’t! I use a similar type of system when reading Twitter on my iPhone. When I see useful posts that I want to refer to later I ‘favorite’ the tweets and then I’ll come back to them later. Often this is so I can email them on to other staff. My email system is to read all my emails, deal with urgent ones ASAP and mark ones for later as unread. The trouble with marking things ‘unread’ is that you have the tyranny of ‘X no. of emails unread’ (which is similar to what you get with RSS readers’. I much prefer starring them.